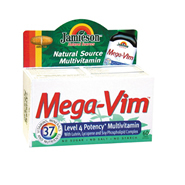 An optimum potency formula containing 37 essential vitamins, minerals and nutrients. Formulated for those individuals that experience elevated or extreme levels of stress, physical demands and energy requirements. Qualified from Jamieson Laboratories as a Level 4 Maximum Potency Multi Formula. Fortified with Lutien, Lycopene and a Phospholipid Complex derived from Phosphatidyl Serine and Phophotidyl Choline. These insurance nutrients support brain health, act as natural anti-inflammatories and protect cell membranes from oxidative stress when life conditions are subjected to extreme mental and physical demands. Each caplet contains: Vitamins: Vitamin A (from acetate) 5,000 IU, (from beta carotene) 1,500 IU, Vitamin D 400 IU, Vitamin C 250mg, Vitamin E 150 IU, Vitamin B1 75mg, Vitamin B2 75mg, Vitamin B3 (no-flush niacinamide) 75mg, Vitamin B5 75mg, Vitamin B6 75mg, Vitamin B12 75mg, Folic Acid 400mcg, Biotin 75mcg Minerals: Calicum 150mg, Iron 4mg, Copper 1mg, Iodine .1mg, Magnesium 75mg, Zinc 10mg, Potassium 25mg, Manganese 1mg, Chromium 10mcg, Selenium 10mcg, Vanadium 1mcg, Molybdenum 1mcg Nutrients: Lutein 300mcg, Lycopene 300mcg, Ginseng 10mg, Soy Phosphotidyl Complex 5mg, Digestive Enzyme Absorption Factors (derived form peppermint, bromelaine, papain, amylase, lipase, cellulase) 4,000mg.